Here's a fish hangs in the net, like a poor man's right in the law. Two courts played a pivotal role in the last two years of Sonic basketball – the court we have come to expect, made up of hardwood and stretching 94 feet in length, and the court with which we sadly grew increasingly familiar, the one in which 5’8” lawyers stand taller than even the tallest center. With those frustrating years in mind, those who followed the shenanigans of Clay Bennett, Howard Schultz, David Stern, and this city may be forgiven for thinking it was always thus, that the wheel in this costly game of roulette has been forever tilted in favor of the all-powerful NBA. That, however, would not be mindful of history. 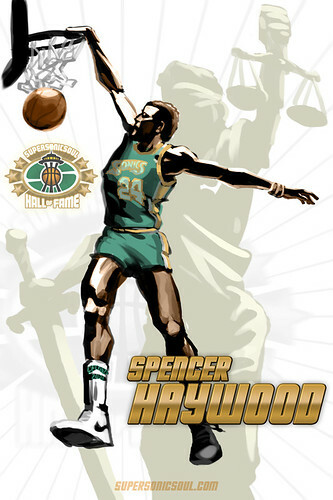 For once upon a time, a man named Haywood slew the mighty beast called the NBA, defeating them in the highest court of them all – the Supreme Court. It was 1970 and Spencer Haywood, a prodigious talent from the fields of Mississippi by way of Motown, was maneuvering himself to enter the NBA, even though he was a mere two years removed from high school. Haywood entered the ABA with the Denver Rockets, but, no fool he, knew the big money and fame was in the league with the “N” and not the “A”, and, after pocketing the ABA’s MVP award, prevailed upon Sonic owner Sam Schulman to sign him to a six-year, $1.5 million contract. And therein laid the problem. The NBA forbade players from playing until they completed four years of college, meaning Haywood, with Schulman’s assistance, had thrown down a massive challenge to an essential part of the league’s structure. Haywood, however, unlike certain current members of the Seattle municipal government, was willing and able to do whatever it took to defeat the league. Haywood would not fight alone. Shed any notions you have that the past few years were the first time Seattle battled the NBA. Back in 1971, more than 35 years before the recent conflagration, the league reacted indignantly to the Sonics’ move to add Haywood, threatening to not only disallow the roster move, but to add “punitive measures” to the Sonics as a franchise. Looking back on the situation with 40 years of hindsight, the whole state of affairs is slightly amazing. Here is a young man being told he is too young to play professional basketball, seeing other men his age being told they’re old enough to die in Vietnam. Like so many other young people of that generation, Haywood rebelled, refusing to knuckle under to authority. You wonder, looking back now, what was going through Haywood’s mind during those months of court trials, through the series of appeals? Remember, Muhammad Ali had just been allowed to fight again, and Ali’s successful battle against what he felt to be an injustice had to be at the forefront of Haywood’s thoughts. Further, as a member of the 1968 Olympic team in Mexico City, he was an eyewitness to the fists raised in defiance by Tommie Smith and John Carlos. Whether he agreed with their position or not, the young man was undoubtedly changed by it. With all of that in mind, contrast the two scenarios, now almost four decades removed. In one, you have a league endeavoring to bully a young man and a free-spirited owner into yielding to its will. Like so many others in the early 70s, Haywood and Schulman would have no part of it, and would take no quarter from the aggressor, regardless of how unlikely their victory seemed. Turn the clock forward forty years, and an entirely different scenario plays out. A manipulative and condescending league office attempts to bully a city into yielding to its will, and it succeeds beyond its wildest dreams. When push came to shove, Haywood pushed back. The city? It just got shoved. Haywood, unlike the City of Seattle and Howard Schultz, would prevail against the league, as the Supreme Court sided with his argument that the league’s policy of forbidding young men from entering its front doors was a restraint of trade and, hence, utterly illegal. Forty years have passed since Spencer Haywood challenged the NBA. The NBA continues to force its morals on poor black men by denying them an opportunity to earn a living because of their “youth,” while men the same age as they go off to die in an increasingly unpopular war. Forty years ago, such revolutionaries as Joan Baez, James Brown, Spencer Haywood, and Muhammad Ali fought injustices, putting their own lives behind the causes in which they believed. Today, that spirit of sacrifice and noble pursuit of righteousness seems to have vanished, a long-forgotten relic of the nation’s past. As Jabbar points out on his blog, at the same time as black soldiers were being led off to fight for their country in Vietnam, black basketball players were being asked to go off to fight for their country in Mexico City. In both cases, Jabbar writes, those who left came back to be treated as second-class citizens. Now contrast that set of emotions from 40 years ago to the series of events in Beijing at the just-completed Summer Olympics. Now, you have a group kowtowing to every whim of the Chinese officials, the entire roster forbidden from even speaking a word contrary to the glory which is China, let alone contemplating a boycott. Now, you have a group of black men being silenced by white authority figures. An observer far-removed would wonder, what has happened to this country in the gulf of time separating 1968 from 2008? Where, he might also wonder, have all the Spencer Haywoods gone? Best Sonic ever, IMO, with the exception of Gary Payton. 4 times either 1st or 2nd team all-NBA, the best of any non-Payton Sonic. I wasn't sure Haywood should be in the Supersonicsoul Hall, you know, since his era predates the time me, Pete and Paul were alive. But having read this, I feel stupid to have even considered omitting him. Thanks for schooling me, homey. I can't imagine how badly Haywood would get ripped by the media and the league if he had been born 30 years later and he was going through the situation he went through now instead of then (that was really confusing, but it makes sense if you re-read the sentence six times). I'd like to think that the public would see he was on the right side of the argument, but I'm not optimistic about that thought. Sweet artwork, guys. Love the background justice lady, and the Haywood drawing looks like it came straight out of a Sonic program from 1972!